Today's "Tuesday Tool" is compliments of Marly, who won the "Grow Your Blog" giveaway last Friday. Whenever I send a giveaway prize out of the country, I ask the recipient if there is something she can't get in her country that she'd like me to send. I know not everyone is lucky enough to have four great quilt shops in her town! No, she said, the kind that go on straight pins. Marly included a link to the blog where she first saw them. I'm always happy to have something new to shop for, so I went on a mission. Would you believe I found them right over the hill at Ruth's Stitchery? I'd seen them before, but didn't realize that they were for. 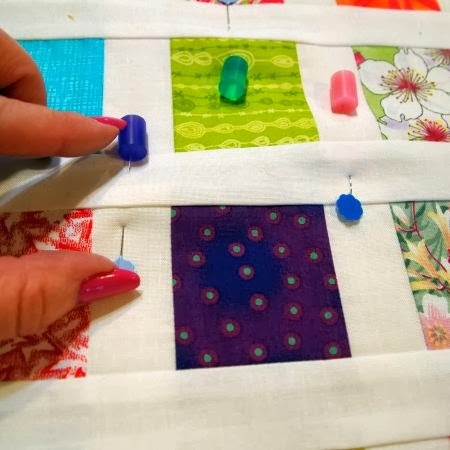 If you use long straight pins to baste your quilts (and I do, for table runners and mug rugs), your fingers will thank you for buying this product! Pinmoors are a kind of soft, rubbery pellet that covers the sharp end of your straight pins. Then you won't stab yourself when shifting the quilt to machine quilt it! PS, I've received two compliments on my fingernails this week. It makes me laugh, because I've been painting my nails since 6th grade -- umm, well over 40 years! I decided that when I post a photo with my fingernails in it, I should tell you the polish color! The bright pink in the photo above is a new brand to me, Sephora. This color is "no need for a bikini!" Thank you, Marly, your patterns and Pinmoors are on their way! I've never heard of Pinmoors Marti! 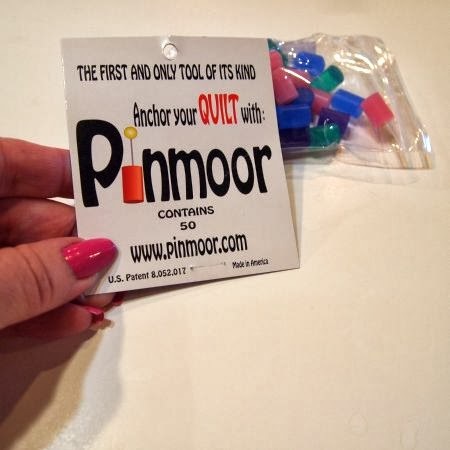 Pinmoors are one of my favorite notions…I even use them on the end of my seam ripper and sewing needles!! Those pinmoors will save a lot of ouches when sewing quilts, I'm sure. What a natty idea, Id never heard or seen them either! Oh wow! I love the idea of those things. Neat!! So glad she asked! I love the Pinmoors. My constant pin pricks are a thing of the past. I had never heard of these, but was just thinking (and dreading) that I needed to get my quilt pinned. I think I will be going and looking for these! Clever idea - I had seen them but not purchased any. Love the name of the colour - I am sure you are familiar with OPI colours too - they have great names too - may favourite being "I'm Not Really A Waitress"